I love your post. I, too, am really touched by music. I’ve played the piano since a child and one of my favorite things is playing in church. Music CAN really take you back. I know exactly what you mean about hearing songs from your teen years and remembering the words bc that happens to me, too. 🙂 Nowadays we often have music playing in our house. I would be so lost without it. Blessings to you! Thanks so much for visiting my site, Gayl! I’m so enjoying “meeting” all these wonderful women who blog. I’m rather new at it, but am enjoying it immensely and hoping to be an encouragement to others, as they are to myself. I’m glad you enjoyed my post. Blessings to you as well! Knowing God’s character and trusting Him go hand in hand, don’t they? It’s almost impossible to trust someone you don’t really know! I agree about music, it can have a powerful effect on us! 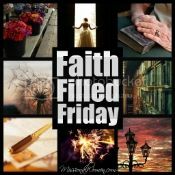 I’m visiting today from Faith Filled Friday, Missional Women. I’m so glad I stopped by. I really enjoyed your post! Thanks so much for visiting, Donna! It’s wonderful to be able to use technology in such a way to “meet” others, and to bless and encourage one another. I’m really enjoying these link-ups. I’m so glad you enjoyed this post. Hi Anne, visiting from five minute Friday 🙂 I love love love that you ate my neighbor this week. I’m a huge music lover too–any time you put on Sara Groves, I’m pretty much in my own little world. Her music has been encouraging for the last year and has made me wish I could play piano. I feel very close to God when I sing along with her. Same with Ellie Holcomb. Their music has helped me remember God in a very tough season. And anytime Hilary Duff comes on, I’m transported back to being in my room singing on my karaoke machine. I’m trying to trust God with a capital T; this week has felt like a test I feel I’ve failed, but I’ve been pulled to talk to Him more and more. And my idea of fail I’m not sure aligns with God’s definition. Hi Julia. So nice of you to stop by! We love Sara Groves, and believe it or not, a couple of years ago (through some kind of awesome connections), she did a concert at our mid-size, New England church! It was a highlight I will always remember. I will have to check out the other musicians you mentioned; seems we can no longer keep up with the growing list of Christian music artists. My husband and I both serve in our church worship team and I’m a “rusty” pianist myself. Praying that you will feel God’s presence and hear his voice. Thanks for visiting! Um, that would be a moment I would forget either! That sounds like God set up right there 🙂 Anf I know! There are so many different artists that have helped me experience God’s presence — like when I first came to Him in music, I was all into Christian rap. And Jamie Grace. It’s totally seemed to mellow lately. & Someone’s watching over me are by Hilary Duff are two of my faves.